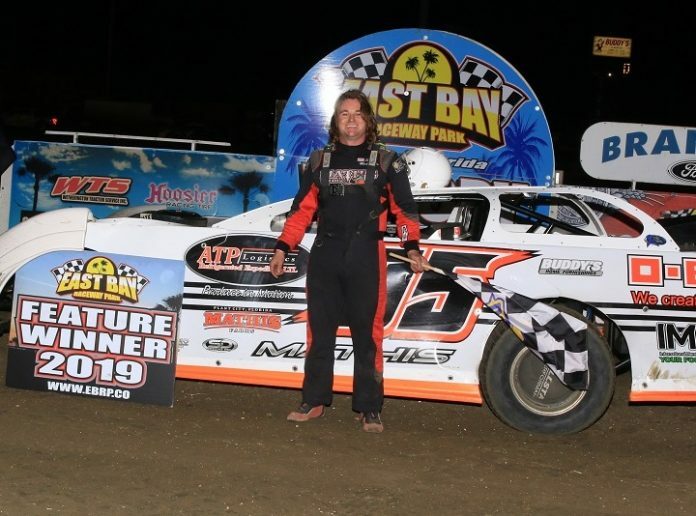 GIBSONTON, Fla. — Steve Mathis Jr. prevailed during Thursday night’s 30-lap Stingray Performance Parts Crate Late Model feature at East Bay Raceway Park. A.J. Maddox won the companion Top Gun Sprint Series feature. Walker Arthur took the early lead in the crate late model main event, but it didn’t take long for Kenny Monahan to jump up to the top spot. The new leader set a torrid pace, catching the back of the field by lap seven. After a lap-10 restart, Travis Varnadore blasted past Monahan in turn two to move out front. Monahan was not done, pick up the lead again a lap later. Varnadore came right back and trouble hit Monahan, who spun from second and was collected by four cars. This turn of events put fast-qualifier Cobb on the back bumper of the leader. Those two were bypassed by Devin Dixon, who grabbed the lead from the high side. Dixon’s lead was brief as Varnadore found his way back to the front. Dixon came back, but as quickly as he grabbed the lead, he lost it, this time to Keith Nosbisch. All the while, Mathis was quietly gaining positions until he found himself behind Nosbisch on a lap-21 restart. While Nosbisch pulled away, Mathis was able to chip away to grab the lead in just three laps. From there, it was all Mathis to the checkered, despite late race cautions and restarts. Steve Mathis Jr., Keith Nosbisch, Travis Varnadore, Doug Horton, Devin Dixon, Matt Cooper, Kenny Monahan, Clay Harris, Chad Stapleton, Shan Smith, Todd Cooney, Troy Frazier, Ronnie Cooper, Logan Roberson, Adam Ray, Trever Taylor, Mike Franklin, Daniel Woody, Megan Rae Meyer, Austin Burns, Walker Arthur, Phillip Cobb, Andrew Hopkins, Jimmy Waldrop.